Given the raft of new full-frame cameras introduced recently, Canon surprised APS-C fans with the announcement of the Canon EOS 7D Mk II. Although the increase in pixel count is modest (up just 2 Mpix overall), as the replacement for the 5-year old EOS 7D, the new model features numerous improvements. It’s the first pro-level model to adopt a newly-developed 20.2-MPix APS-C CMOS sensor with the firm’s Dual Pixel AF technology, permitting phase-detection AF capability during Live View and movie capture. It also has a new 65-point phase-detect AF system in the viewfinder with close to 80% coverage across the frame, and adopts cross-type (vertical and horizontal line) sensors at each point. It has a similar layout to the AF system in the EOS 5D Mk III and 1 DX, and has similar controls and menu options to those models. Other pro-level features include interchangeable focus screens (with a super-precision matte option for high-speed lenses), 100% viewfinder coverage, and continuous shooting at up to 10fps. Unlike some recent rival models, the LCD is fixed (presumably for improved sealing and long-term durability), but it’s a 3-inch panel with 1.04M-dots. In addition to the Dual Pixel AF option during video capture, the new camera has been equipped with an extensive range of additional filmmaking capabilities. Options include a choice of MOV (H.264) or MP4 formats, numerous compression formats (IPB, ALL-I and Light IPB), slow motion (50/60fps), plus headphone and mic sockets as well as a mini-HDMI output to external recorders. 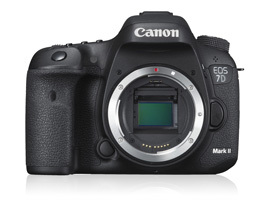 The new Canon EOS 7D Mk II measures 5.9 x 4.4 x 3.1″ / 148.6 x 112.4 x 78.2 mm and weighs just 2.00 lbs / 910g with battery card. It is available to pre-order for $1799 body only or $2,149 complete with the stabilized EF-S 18-135mm f4.5-5.6 IS STM zoom. 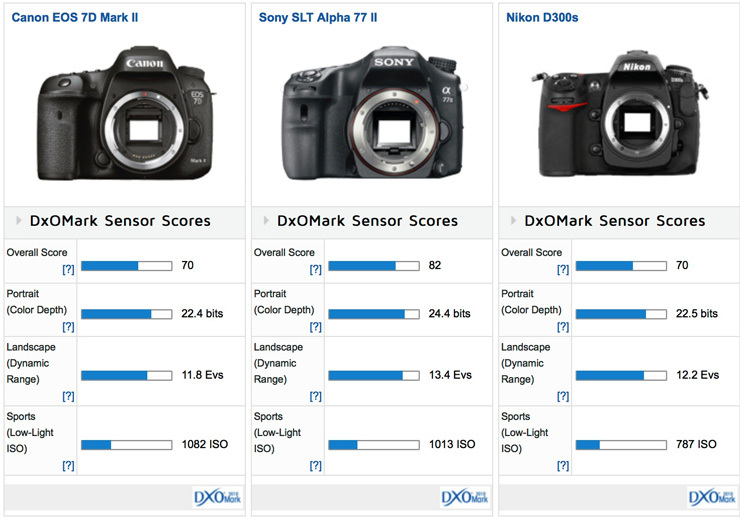 With a DxOMark Sensor score of 70 points, the EOS 7D Mk II ranks behind some older, smaller Micro-Four-Thirds sensors such as those used by the highly-regarded mirrorless Olympus OM-D E-M1 and Lumix DMC, which is a little discouraging. Color sensitivity at 22.4 bits is good but remains behind the best in class, while the dynamic range at base ISO (measured at ISO 94) is somewhat lower then we might expect at 11.8 Evs. 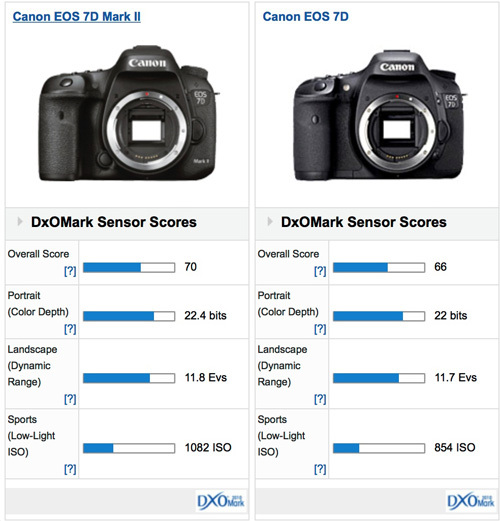 However, despite the performance at low ISOs (attributable to higher than average shadow noise), the Canon EOS 7D Mk II performs on par with rivals at higher ISOs, with an ISO score of 1082 in the Low-Light category. 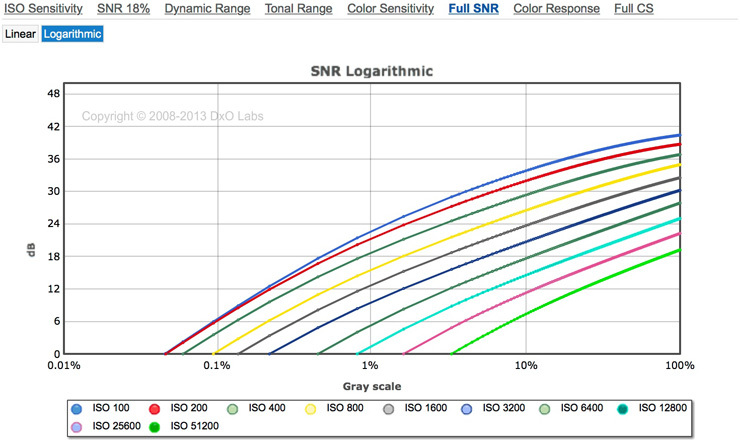 Noise levels at low ISOs continue to hinder Canon sensor performance. With the addition of Dual Pixel COS AF and a nominal increase in pixel count, the new Mark II shows some incremental improvements. From the sensor performance point of view, a four-point lead over its predecessor is really only a modest advancement. That’s the equivalent to around 1/3-stop improvement in color sensitivity, just 0.1 Ev in DR (albeit at base ISO) and about a 1/3-stop improvement in low-light sensitivity. 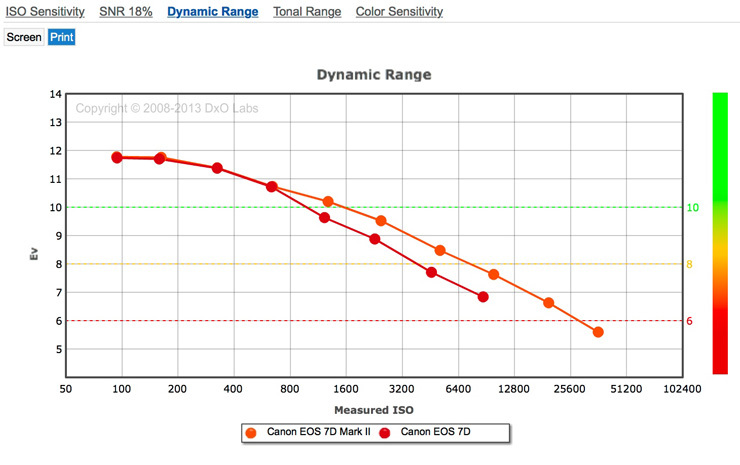 Although there’s no real improvement at base ISO, the EOS 7D Mk II has improved DR at higher ISOs. Although rival Nikon has yet to update the aging but still admired 12-Mpix D300s, Sony has been actively developing models across various segments. Its 2011 SLT A77 has recently been upgraded with a mark II version that introduces a newly-developed 24-Mpix sensor presumably like that found on the A6000, albeit without on-chip PD-AF pixels. Although the sensor sits behind a permanent semi-silvered (a.k.a. translucent) mirror, it’s the best performing of the three models with regard to color sensitivity and dynamic range, though the light loss from the mirror inevitably has a bearing on the low-light score. Although the five-year old Nikon D300s sensor achieves a similar performance overall to that of the newer Canon, it’s worth keeping in mind the latter model’s pixel count, along with the novel Dual Pixel AF system and 10fps continuous shooting. Although the Canon has a slightly narrower dynamic range at lower ISOs it’s easily on a par with the Sony from ISO 400 onwards, and it’s noticeably wider than the Nikon from ISO 200 onwards. On paper, the Canon EOS 7D Mk II looks to be a solid choice for sports and action photographers, but its sensor performance is somewhat behind the best in class, at least at low ISOs. 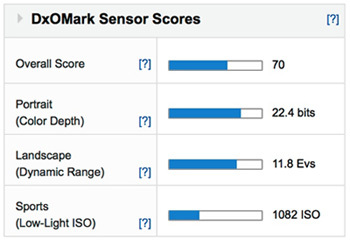 Relatively high noise, less discriminating color, and below-average DR at base ISO all continue to hold back Canon sensors against rivals, but that’s not the case at higher sensitivities. 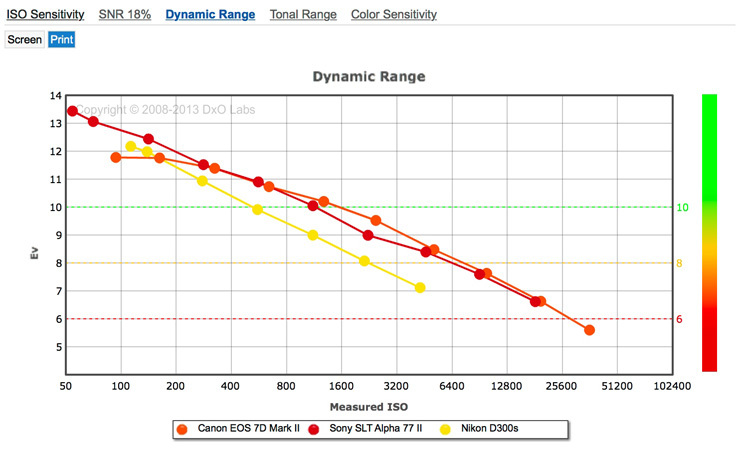 In fact, when light levels fall, the Canon EOS 7D Mk II performs competitively, even surpassing rivals slightly. If Canon could only address performance at base and low ISO, the EOS 7D Mk II would make a thoroughly convincing all-round choice, but in this category the Sony A77 II looks to be the more compelling option.